I doubt we have much in common. In fact, I’d bet money on it. And I wish this were a dia-blog so that this could be a conversation, but given the medium, this will have to serve as a letter to you, to those who still, after every policy this governor has proposed, support him, his policies, and perhaps even see him as a frontrunner for the next Commander-in-Chief. Because I know you exist. I know you love this man. You see him making “tough decisions” and “sticking it to” those you feel caused you financial pain or somehow wronged you in this life. I want you to know I respect your opinion to support him, defend your right to vote for him or whomever you feel best represents the best interests of you and your own, but I also need to know, truly and honestly, why. Why you still support him. Because for the life of me, I can’t think of one justifiable reason anyone who isn’t directly benefiting from him financially (i.e. giant corporations), feels as though this governor and his policies are making their lives better. I can understand why you voted for him in 2010. I can even understand why you supported him in 2014–many of my conservative friends truly had no idea, nor had Walker run on the policies he proposed in his initial budget that have upended workers’ rights in Wisconsin, dismantled public education, and made history by putting Wisconsin on the map for all the wrong reasons. But now? I’d like to take a minute to assess the damage this governor has done to this state in an attempt to show you exactly how he has directly and indirectly negatively impacted you, your friends, your families, and your fellow citizens. What has garnered the most attention was the issue of open records. As The Green Bay Gazette, pointed out, strange bedfellows lined up against the open records gutting in the biennial budget including the Center for Media and Democracy, WI Attorney General Brad Shimel (R), State Sen. Robert Cowles, (R-Allouez), The Wisconsin Freedom of Information Council, the Madison chapter of the Society of Professional Journalists, One Wisconsin Now, the conservative think-tank, the MacIver Institute for Public Policy and the conservative Wisconsin Institute for Law & Liberty. Not shockingly, none of the lawmakers that slipped the measure in were willing to take credit for it. So, to you, dear Walker supporters, what will it take? If a horrible economy, corrupt policies, and a sheer contempt for the state you live in isn’t enough, what will it take for you to stop supporting this man? Because all of this comes down to voting. And I fear, to many Walker supporters and many voters in general, facts don’t matter. We like to create our own facts. We like to watch news that merely reflects our existing opinions. In the New York Times this week, David Leonhardt pointed out that “not only are people more likely to believe information that fits their pre-existing beliefs, but they’re also more likely to go looking for such information.” And, in addition to seeking out information that conforms to our existing narratives, we accept language given to us by others rather than creating our own frames. As Paul Fanlund points out, in many cases, progressives use the language of the GOP to frame our arguments. He states, “But here’s the thing: By focusing with such zeal on Walker, might we be bolstering his brand by allowing issue debates to occur on the GOP’s rhetorical turf?” Yes. Instead of reframing, or using new ways to talk about things like liberty, freedom, and other moral values, we accept and reinforce existing frames. If you get cancer or break a leg and do not have health insurance, you are not free. If you can’t get a decent education, you are not free. If you are a woman and do not control your body, you are not free. If you cannot marry someone you love, you are not free. If your work largely benefits only the wealthiest of the wealthy and not you, you are not free. If you are treated with suspicion or disdain because of your race, you are not free. If a few billionaires determine election outcomes, you are not free. If you cannot easily vote, you are not free. If you are not protected from harmful products and fraudulent business practices, you are not free. If companies are allowed to foul the air you breathe and the water you drink, you are not free. This is not new. Think of the ways in which we look at taxes. The word “taxes,” has become synonymous with something Americans need to be “relieved from” since the phrase “tax relief” was first invented–yes invented–by the same people who decided it would be wise to start using the phrase “climate change” instead of “global warming” because it sounded more benign; by the same people who figured out more Americans would oppose the “estate tax” if it were relabeled the “death tax” because that sounded far more insidious. Language is powerful–so powerful that we no longer see the constructedness of these labels–they’re just a given. We see taxation as an affliction or burden and since there is no established frame or language that discusses taxes as an investment or a public good, we default to the idea that tax cuts *are* good–no matter how paltry or insignificant. So when Governor Walker claimed he would hold true to his promised property tax cut that would amount to $10 over the next two years for the owner of a median-valued home, a savings of $5 a year for Wisconsin homeowners who meet this criteria, he made the mistake of including the actual dollar amount. When we hear we’re getting a tax break or a tax cut, the average citizen assumes they’re going to be saving hundreds or thousands of dollars per year. In this instance, many pounced on the idea that the dollar amount was so low, and that the cuts proposed were so deep, they’d gladly give back those five dollars if it meant saving jobs, keeping the UW System in tact, and if it meant not having to make cuts to programs around the state. “What is taxation? Taxation is what you pay to live in a civilized country-what you pay to have democracy and opportunity, and what you pay to use the infrastructure paid for by previous taxpayers: the highways system, the Internet . . . Taxation is paying your dues, paying your membership fee in America. If you join a country club or a community center, you pay fees. Why? You did not build the swimming pool. You have to maintain it.You did not build the basketball court.Someone has to clean it. You may not use the squash court, but you still have to pay your dues. Otherwise it won’t be maintained and will fall apart” (24-25). A year ago, Wisconsin lawmakers approved a more than $800 million tax-cut package after budget forecasters projected a nearly billion-dollar windfall in unanticipated tax revenue. Now, the state will collect less than half of the projected $912 million that was the basis for the tax-cut package last year. The nonpartisan Legislative Fiscal Bureau projects the state will end the year with a $233 million deficit after starting the year with a $517 million surplus. It is the idea that tax cuts will produce revenue, coupled with the idea the we need “relief” from taxes that allowed this to happen. We need to reframe the debate–to look at taxes as an investment, and tell your legislators and Governor Walker that they can keep your $5. That they can keep your $5 and use it to restore funds for counseling services on college campuses. That they can keep your $5 and use it to bring back study abroad programs, jobs, and cuts to public media. That they can keep your five dollars so Wisconsin can rebuild our economy, our infrastructure, and our once enviable educational institutions. Walker supporters, if you are not swayed by facts, by frames, by narratives, and by language, then let me attempt to appeal to your most base patriotic notions of what is good, fair, just, and democratic. In an excerpt from a blog written specifically in regards to the Declaration of Independence and Walker’s policies in Wisconsin, the author writes, “‘Consent of the governed’ is a key phrase, because it implies that in the mind of the Founders legislators would have told the people how they intend to govern, and that people should have approved of the policies and actions that are taking place, likely through elections. Does that sound like this crew, who have governed by surprise and instituted numerous policies in this budget that they never ran on last November . . . .Think about the state’s secretive gerrymandering and numerous examples of the overriding of local initiatives and powers. These moves have skewed the makeup of the state’s legislature and laws to something that does not reflect the views of the state and local areas. The most recent example is the gutting of the state’s long-established open records laws last night, but it’s far from the only time Walker and his minions in the Legislature have ‘dropped the bomb’ on numerous initiatives without warning. These last four years have featured plenty of ‘special’ and ‘extraordinary’ sessions to limit debate on non-pressing issues, and this budget session has seen numerous omnibus measures be introduced into the Joint Finance with no formal hearing, no public notice, and little connection to the budget items scheduled to be discussed. He has dissolved Representative Houses repeatedly, for opposing with manly firmness his invasions on the rights of the people…. In all reality, those of you who support Governor Walker and his policies will never read this. But to those who do, I truly ask you to take a look at your life. At your neighbors’ lives. And ask yourself, am I proud of the state I live in? Is this the path I want our state to continue on? Is this the future I want for my children, my grandchildren, and for those who will reside in this state long after I’m gone? Because elections are all we have left. The damage done to this state was both preventable and is now irreversible. Those who have all the power will continue to abuse it, use it for their own political and financial gains, and in the end we all suffer together. History tells us that the pendulum always swings when any party in power is perceived as having gone too far in their overreach. I have faith that history will repeat itself–that the backlash from so many ill-advised policies will spawn a win for Democrats in 2016. I’m also a realist. And I just don’t know what it will take for so many ardent supporters to finally see through this man’s agenda, his willingness to destroy his own state for political gain and a shot at the presidency, and for those supporters to stop voting against their best interests and start voting for those who want this state to thrive again. 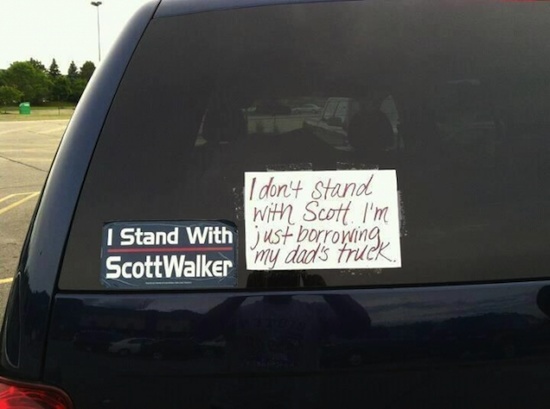 Walker supporters, what will it take? What will you do in the next election? It is you we need now to turn this around. It is you we need to step up, put aside falsehoods, stereotypes, misplaced bitterness and anger, and vote for candidates that will restore this state to her glory. Without you, we continue to suffer together. Without you, our state remains divided and broken. And without you, those drunk with power will continue to drive this state and its people further into desolation and despair. Thank you for writing this letter. It says what I feel. Scott Walker is bad news for the working class person.I hope people do just a little research on him,the open records laws was just another example.And Walker as Commander and Chief,like Obama said look to Minnesota they done things the proper way and it is showing.They did not divide and polarize the state,that is how you govern.Also the supreme court got it right to. This is a very powerful letter. I just feel so sad that as you said many will not read this and if they do will not get it due to their blindness to what their good old party is trying to do to Wisconsin and the USA. Thank you for writing this. About “using the language of the GOP to frame our arguments,” a friend, a Democrat, said he agrees with some of the Republican ideals, like everyone should work to pay their own way. And I said to him, Democrats believe that too. Since when did work ethic become a Republican idea? It is time for Democrats, Independents or whomever, to stop being quiet and start confronting. I wish I had read this before sending this email out to our legislators. You open letter says so much of what I wanted to say and missed that I apologize to you for this poorly written email. I hope you enjoyed our freedoms, Freedom of Religion, freedom of Speech. I could not help but to think about how hard millions of other Veterans, and myself worked for those and other freedoms. I served in the Army in the late 60’s and early 70’s. We were fighting to defeat Communism around the world and in this country. What made me think of this today more than anything else happening today was the headline of the newspaper and many postings on my Facebook. You see I saw that there is another shot at our freedom coming from the drafting of our State budget. This budget has constantly been assaulted with back room deals and late night amendments, constantly taking shots at our freedoms. From prevailing wages, the University system, Public schools, etcetera, and now the Freedom of information act to put the icing on the cake. These actions are marching us toward that infamous form of government that millions fought to protect us from. I guess the only way that anyone has the right to freedom, in this state is if you have a lot of money. I highly urge you to vote this budget down and start over. This time listen to the rest of the Legislators and work to make a fair and sensible budget. One without backroom deals, one that does not need lies to support it. A budget that has the top 1% paying a fair share of taxes, comparable to the rest of us. Take away some of the unfair tax breaks from the very reach and give something to the people that really need help. Eliminate the qualifiers from assistant payments. Get the money needed to complete the construction projects that have already been started, and those that are really needed to make our roads and other properties safe. Do not let Party favoritism, Cronyism, Grover Norquist, the Koch Brothers, or any other entity interfere. It is high time that the budget work for the people of the state of Wisconsin and not for the special interests of either party, whether or not they pay for your political campaigns. This does not shut down the state government since it will continue on extension of the present budget until a good and honest budget is pasted. Well said!!! As a teacher, I am tired of being beaten down by my legislators and those who believe Walker, Fitzgerald and Fox News. The last comment says it all. Democrats need to open their mouths , the facts are on their side. If you stand up to a bully, they will back down. Thank you for writing this letter. I have often thought about writing a letter like this, but I was too depressed to start it. My life changed for the worse when Walker was elected. I saw who my true friends and loyal family members were. I experienced so much hurt from so-called friends and family members during the whole Walker recall time period. I cried a lot and wondered why people were so happy that I was getting less for the job I did. I left a high-paying professional position in the private sector to work in the schools with young children. I didn’t feel that what I was doing in the private sector was truly benefiting society. When I starting working in the schools, I thought I was doing a good thing and I felt great about that. My feelings of accomplishment and joy made up for the huge pay cut. When Walker came into office and pushed through Act 10, I felt like someone kicked me in the stomach and told me that what I was doing was not worth fair pay and fair benefits. My wage is at the poverty level now, but I will continue to do what I am doing. There are so many needy children in our schools who I feel that I can help get a good start in life. I don’t like wishing for bad things to happen to people, but I do hope that Walker will experience Karma. Stated very well, now for an expose` on the ill effects of not voting a’tall….. I would like to see an expose` on where all the money went! He used the debt to justify taking the money from teachers and public service workers. That was not a one time event. That is ongoing every single year. Now money is needed from the UW budget. Why? Where is it all going? We even had to miss a debt payment? Why? How is lowering everyone’s income, the above plus right to work and repealing prevailing wage going to help our debt? Isn’t the state taking in less revenue with these measures? Don’t we pay debt with revenue? I know Scott Walker did not graduate from college, but I only went to NWTC and things are not adding up to me. Who exactly is writing these budgets and new laws? Shouldn’t there be a basic competency level before being put in charge of such things? I truly believe we Democrat’s will show them at the polls in 2016. We must really rally our fellow voters that’s how we got Obama in. Please keep in mind the Republicans are really using technology to put such crazy rumors out there. My dad says this-morning that Obama is trying to rid July 4th celebrations to protect the environment. Really dad, please don’t gulp this talk down. It just goes on and on. Sometimes just pointing out how ridiculous their talk is, is what it takes to remind someone to use their common sense. The number of Republicans throwing their names into the ring for 2016 should be a good sign they are worried. Their way of thinking is to throw in a high number and the odds may tilt in their favor from voters. Remember my friends, these are people who are running scared so keep your sense about you, don’t let their mouth sway you as we all no not one has actually done what they said they would do for us all while in the race. Obama, in my opinion is the first real President who has stood by his promises and made good judgments for us all. so well stated – thank you. I have friends and neighbors who are so blinded to what’s really going on in our state. One friend [financial planner] said SW is great for her line of work, another [claims to be a Christian] yet nothing SW and his GOP Legislature has done is loving, caring, kind or “Christ” like. Neighbors in WA county who don’t look or listen at facts but follow FOX NEWS [the tv programs of blatant lies]. It’s sad to be so far removed from what is really happening to them and to our state. It’s shameful, unethical, ruthless, and corrupt. Great letter. And you are right, Walker keeps putting voters against each other as a means to madness. As voters, we need to come together to strengthen each other and our state instead of beating each other down. When a politician tampers with the economic engine of the state, (University of Wisconsin), and the public education system of the state, there is no future in what the state can achieve in terms of progress. If there is poor economic growth, poor education, poor jobs, then we are forcing our young to join in conflict and war. If we as an educated, technological society stand for this type of leader, then we are doing nothing more than allowing an ideology such as Nazism to repeat itself. I have great difficulty understanding why some people are blind to the actions of this legislative body? This isn’t rocket science. As a UW Staff Member (Not Academic.. we are the civil service, classified staffers – hourly ) who just received his layoff notice this week due to budget cuts, I thank you for this letter. I have the privilege/curse of seeing the situation from the inside out and I can honestly say, this …this is powerful. I moved from the wonderful state of WI when the handwriting was on the wall with the wonderful governor Walker. I’m sorry to say his message of the evils of the public employees, which both my husband and I had been for over 25 years, was distressing and disheartening. I hate to see what he has done to your wonderful state. I fear what he would do to this wonderful country where he to be elected president. I have many friends who have always felt his policies were fair and above board while I haven’t trusted his dealings from the start. I think my “paranoia” has proven to be warranted. Thank you for your well researched letter, full of facts and one that will be hard for even his most ardent supporters to ignore. Sure, I can write. But this, this is damn good. This is good stuff. Bernie Sanders.